Metta is one of the fundamental principles of Thai massage and is also applied to all other Buddhist healing arts. 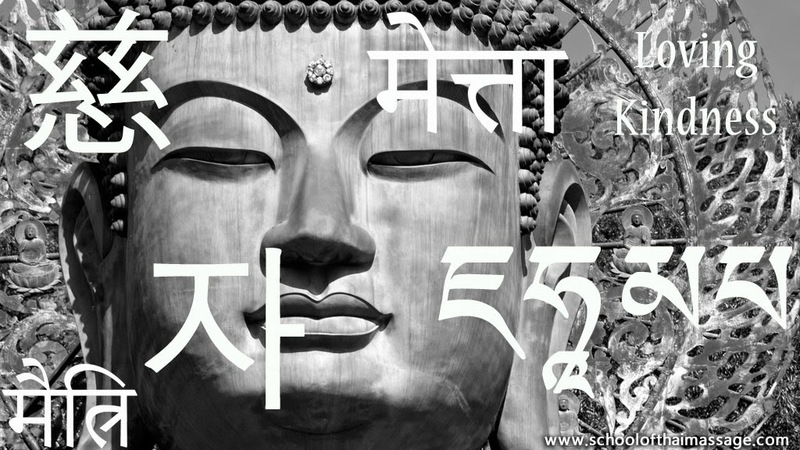 Metta is a word in Pali and Thai that means Loving Kindness or sometimes can be translated as friendliness. Metta is also one of the four perfections in Buddhism. A Thai Massage practitioner working with Metta maintains a feeling of detachment and empathy simultaneously for the suffering of another sentient being. Metta allows the healer to get a better and more objective opinion of the root cause of the disease. It’s a bit like going to talk to a close friend about my troubles. I know that she has my best interests at heart, yet she is a bit removed from my situation, and therefore, she can give me a more objective view of my situation. It is critical that the feeling of empathy or concern for another person's suffering must be accompanied by detachment. A healer with only empathy and no detachment will not be able to give her best as she will not be able to maintain the calmness and equanimity required to make a good observation of the malaise and, therefore, aid the client in the resolution. At the other end if the healer has only detachment and no empathy then it would be similar to some modern-day medical professionals who are more interested in money than healing. How can one develop Metta? The process of formulating Metta requires experience with suffering! Of course, the more one has lived, the more one suffers, and this is a good starting base for developing Metta as a healer. People who have suffered are often the best healers. The process of developing Metta requires one to start with the Self, realizing with experience (no intellectualism) suffering, impermanence, and detachment. While empathizing with one’s suffering is quite easy, however developing detachment towards it can be little trickier. The key to developing detachment to one’s suffering is to stay with it and observe its depth, quality, source and effect. In the 21st century where people are barely able to concentrate on their pleasures, it is even harder to focus on one’s suffering without giving into the desire to escape it. Assuming that one can do this then one will observe that in time the suffering subsides and the truth of impermanence of both the Self and its Suffering will be realized. Once this part has been internalized well i.e., that suffering is always around, and all suffering is impermanent like everything else, then one can start work by observing the suffering of others with empathy. After all, their suffering is similar to one’s own but also with detachment because one knows it is impermanent. The realization comes when we understand that there is no “I” which, separates us from others and everything else. The truth is that there is no separation. The suffering of your client is the same as yours and arises from the ignorance of thinking that there is a separation. Metta is the responsibility of love without the clinging and attachment as is quite distinct from the modern day "no-strings-attached-relationships". Metta is a responsibility and not a pleasure trip. A healer operating with Metta feels the sense of responsibility to help the client out of their suffering, but the healer also knows that client is perhaps more responsible for their healing than the healer. Metta is not an effortless perfection to attain because it exists on the fine line between love with responsibility and detachment. To do this well, one will need the next perfection Upekkha or Equanimity.